If you're a fan of convertible tablet PCs, then you may like to know that HP recently announced the next generation in their 2700p series. I currently still have a 2730p which is the 2nd generation in this series. I skipped the 2740p and now HP is coming out with the 2760p (what happened to the 2750p?). 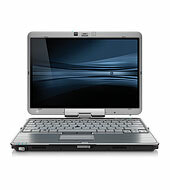 The EliteBook 2760p is a 12.1" convertible tablet PC that closely resembles the 2740p series. At a glance, you may not be able to tell them apart. Some of you may be thinking about the new Lenovo ThinkPad X220 tablet PC. I have an older ThinkPad X200 tablet PC and there are a number of reasons why I prefer the ThinkPad series over the EliteBook and a host of different reasons why I prefer the HP over the Lenovo. (I'm still waiting for one company to combine my wish list of features into a single machine but I haven't found anyone willing to do that yet). If you're looking for a great deal on the HP 2740p series, make sure to check out the HP Business Outlet. You can find some refurbished models along with a few "scratch and dent" computers that will save you hundreds of dollars.